Namibia is located in the south-west of Africa and shares borders to Angola, Botswana, Zambia, South Africa and the Atlantic Ocean. The official language is English. But since Namibia was a German colony from 1884 until 1915 some people also speak German. It’s a very dry and sparsely populated country. 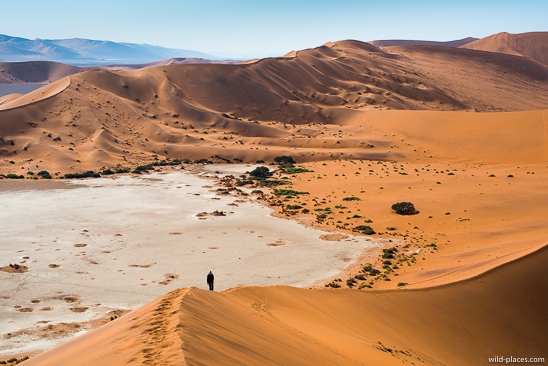 Only 2.1 million people live on an area of 825,615 km2 and areas like the Namib and Kalahari Deserts and the Skeleton Coast are mostly uninhabited. It has the second-lowest population density of any sovereign country (after Mongolia). If you won’t visit the northern parts of Namibia a Malaria prophylaxis is normally not necessary (but better confirm this with your doctor). At the border to Angola and in the Caprivi Strip there is always a very high Malaria risk, while in other northern parts like Etosha it depends on the season (lower risk in winter / dry season and higher risk in summer / wet season). The capital of Namibia is Windhoek, where we arrived after an uneventfull 9 hour flight from Frankfurt with Condor. Since it was late we went directly to our booked room in The Hilltop Guesthouse. This guesthouse is located in a quiet area of Windhoek. The owner Johan is very friendly and helpful and the breakfast is really great. The only disadvantage is, that the walking distance to the city centre is about 45 minutes. On the next morning we picked up our rental car at Africa On Wheels. This is a subsidiary of Caprivi Car Hire. They offer slightly older cars that are well prepared for offroad driving. We had booked a Toyota Land Cruiser HJ100. It was equipped with 33″ MT tyres (Hankook Dynapro MT), 2 spare tyres, a 220 L patrol tank, a steel front bumper, a snorkel and some useful accessories like a spade, tow rope and air compressor. A problem with nearly all rental cars in Namibia is, that they are equipped with a black box with direct online connection to the rental car company. They are always supervising you on which roads and how fast you are driving. Independent of the valid speed limits on the roads you are not allowed to drive faster than 80 km/h on non-tarmac roads. If you drive faster than 80 km/h you will completely loose your insurance in case of an accident. Around Swakopmund you have lots of salt roads which are perfectly flat and look like tarmac and the official allowed speed limit is 110 km/h. Nevertheless these roads count as non-tarmac roads and you still have to drive maximum 80 km/h. Another problem was that the speedometer of our Land Cruiser was not working correctly due to the larger mounted tires. If the speedo says 80 km/h your are already driving at 90 km/h (measured with my GPS). And since the black-box is GPS based and not speedo based you always have to calculate your real velocity by adding a couple of km/h to your speedo value. And all this in addition to driving on the (wrong) left side on gravel roads with a new car in an African environment. You can probably imagine that this can be a bit stressful especially during the first days. After getting some water and food from a nearby supermarket we went to the city center of Windhoek for a short stroll through the city. Sunday afternoon is definitely not the best time to get a good first impression of Windhoek. Not many people were on the streets and a lot of shops were closed. Windhoek rather looked like a ghost town than an African capital. After visiting the Independence Avenue, the Christians Church and the Parliament building ‘Tintenpalast’ we returned to our guesthouse. One advantage of our guesthouse is the very close distance to Joe’s Beerhouse, one of the nicest restaurants in Windhoek, where we went for an early dinner. Joe’s Beerhouse has a great atmosphere and offers some delicious game meals. 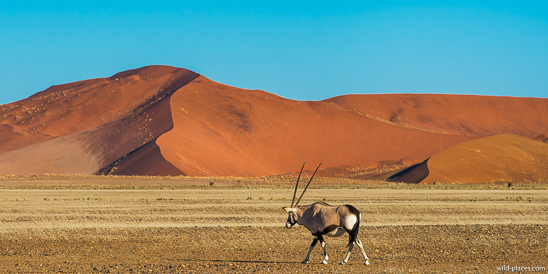 Traveling in Namibia is compared to other African countries rather expensive. Accommodation and rental cars cost about the same as here in Europe. But game meat, steaks and seafood in restaurants are much cheaper than in Europe (or Australia). You can often get a great oryx or beef filet for 10€. If you are a vegetarian like my daughter Linnéa the choices in the restaurants in Namibia are very limited. But often you can get at least one or two vegetarian dishes. If there is nothing on the menu you can always ask if they can prepare some vegetarian meal for you. On the next morning after a another lovely breakfast at our guesthouse we left Windhoek. Our planned next stop was the famous Sossusvlei. 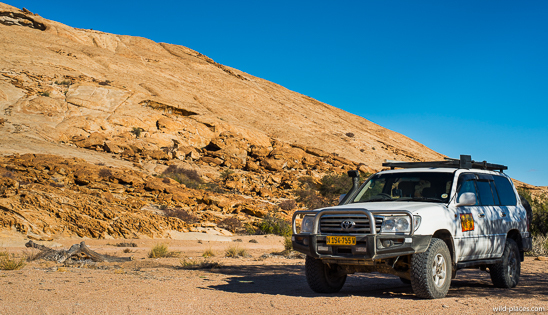 We decided to drive via the Kupferberg Pass, the Spregtshoogte Pass and Solitaire to Sossusvlei. The gravel roads were easy to drive. Even the Spregtshogte Pass is now secured with concrete at the steepest sections. The view from the pass is quite nice but the midday light in Namibia is just not suitable for landscape photography. If you want to get good images you always have to shoot either in the early morning or late afternoon and have to plan your trip accordingly (which is not always easy). After a couple hours of driving we reached Solitaire. It’s a small settlement with a handful of houses. 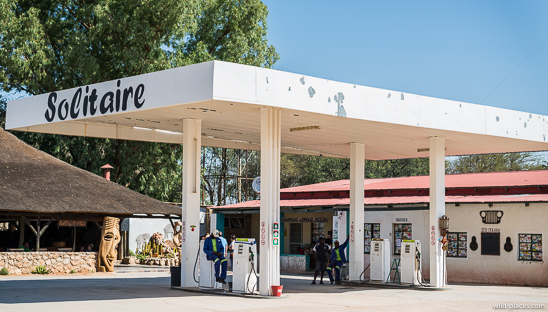 It’s famous because it has the only gas station and the only grocery store between Windhoek, Sossusvlei and Walvis Bay. In addition there is a bakery where they serve a quite famous apple pie. Nearly every guidebook praises it as the best apple cake in Africa. We tried it and it was ok, but not great. 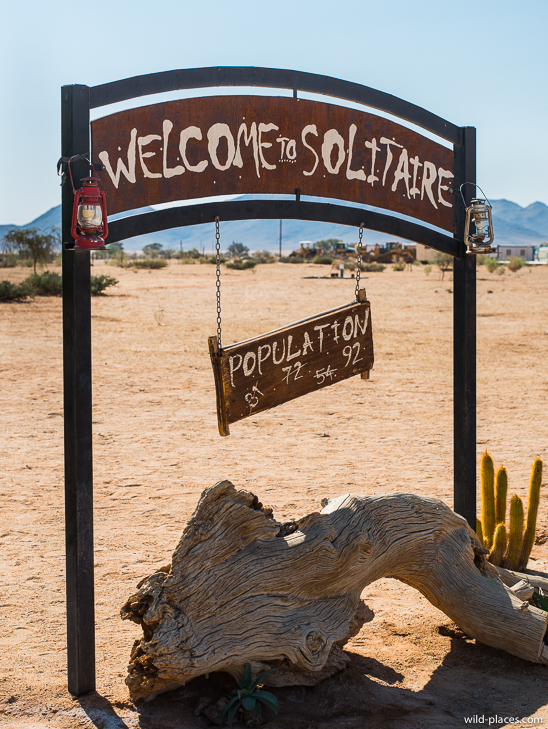 But Solitaire is definitely worth a stop. It has some interesting wild-west like atmosphere and some photogenic car wrecks. 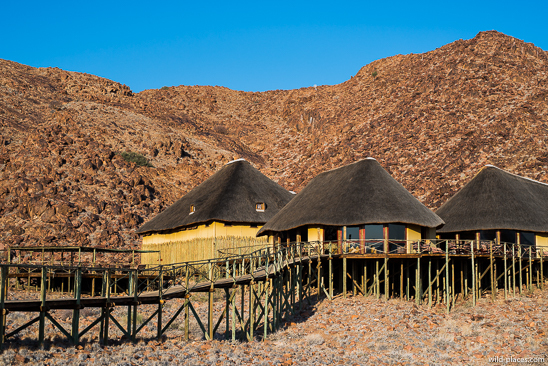 After our short break at Solitaire we continued to Sossusvlei where we stayed at the Sossus Dune Lodge. This lodge consists of 25 very nice chalets. Each chalet has its own small terrace from where you can watch the beautiful sunset. The high season prices of the Sossus Dune Lodge are extremely high, the standard chalet for two adults und one child is 500€ per night including breakfast but without lunch and dinner. From November until end of June it’s low season and you pay half the price. Still high but at least affordable. 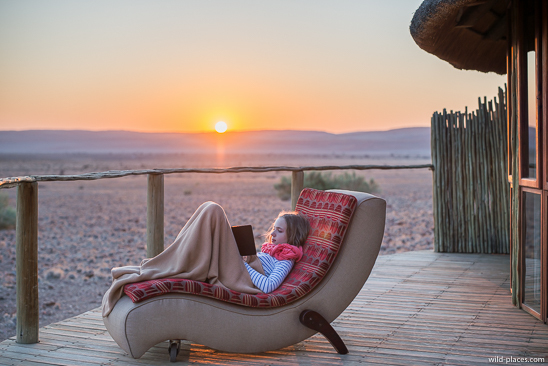 If you want to do some serious landscape photography at Sossuvlei you have no choice but to stay at the Sossus Dune Lodge due to certain park rules. 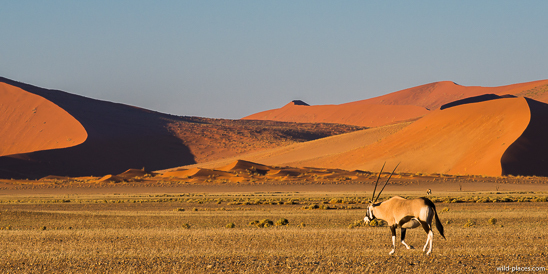 The photogenic Sossusvlei valley is located within a national park. To enter this area you have to cross two gates. The first gate opens at sunrise and closes at sunset. The second gate opens about one hour before sunrise and closes one hour after sunset. Between the two gates is the official NWR campground located. The Sossus Dune Lodge is inside the park borders and has a private road that joins the main park road behind the second gate. All the other lodges are located in front of the first gate. 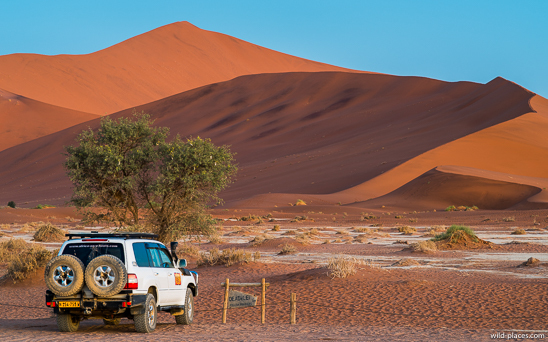 If you want to shoot at the best light at Sossusvlei you either have to stay at the campground or at the Sossus Dune Lodge. 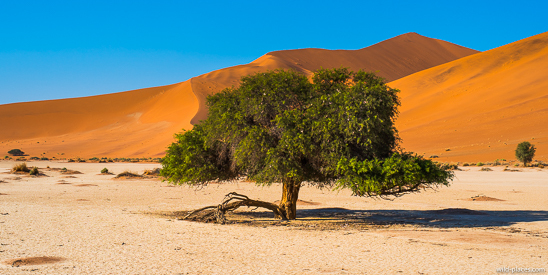 At the end of the Sossusvlei valley is the Deadvlei, one of the most photogenic spots in this area. The drive from the entrance gate to the Deadvlei is about 70 km. The speed limit in the park is 60 km/h and at twilight it is really recommended keeping within the speed limit due to the many animals along the road. This means if you want to shoot before sunrise or after sunset at the Deadvlei your only choice is to stay at Sossus Dune Lodge. Even for the guests of the Sossus Dune Lodge the official rule is, that you should not be within the park between one hour after sunset and one hour before sunrise. But on our visit it was tolerated that we often returned much later to the lodge. On the way to the Deadvlei you pass some other interesting places worth a stop at sunrise or sunset. Shortly after the entrance gate leaves a trail on the right side to the Elim Dune. You can often find animals there since it is less visited by tourists. At km 40 (after the entrance gate) you will find some lovely dunes with interesting structures and lonely trees on the left side. This was besides the Deadvlei my favorite spot in this area. The famous Dune 45 (located at km 45) sadly had too many footprints to be useable for serious landscapes images. We saw in the Sossuvlei area oryx, springbok, ostrich, jackal, owl, baya birds and some other animals. Typical for deserts you have a huge difference between day and night temperatures in Sossusvlei. In the winter months you have day temperatures between 25°C and 35°C and night temperatures just above 0°C. Climbing on dunes is really exhausting. With every step you make you slide half a step back. And if you start in the early morning it gets hotter and hotter every minute. 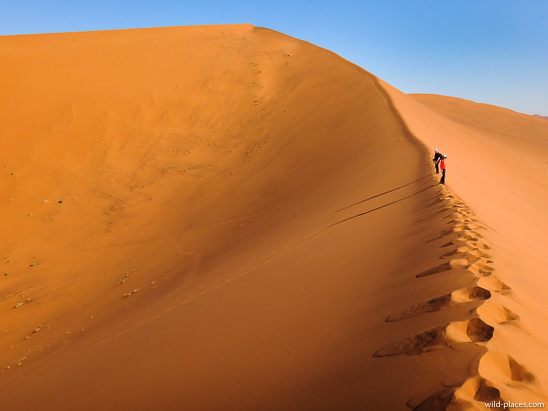 One of the biggest dunes in the world is ‘Big Daddy’ with 350m. We climbed about half the maximum height of this dune at midday temperatures. You get a nice view of the Deadvlei with its famous salt pan and dead trees from there. If you want to visit the Deadvlei, you have three options. To reach the Deadvlei parking lot you have to drive 5 km through very soft sand. If you don’t have a good 4WD you can park your car before this soft sand section and take one of the shuttle busses. The disadvantage is that there are no shuttle busses available before sunrise and after sunset. Another option would be to walk the 5 km. But I would not recommend this, since from the Deadvlei parking lot you have to walk another 2 km to reach the Deadvlei salt pan and more if you want to climb on some of the dunes. The best option is to drive the last 5 km with a suitable car. You definitely need a 4WD. Big tyres, reduced tire pressure, a reduction gear, a powerful engine and some experience in sand driving will further help not getting stuck. 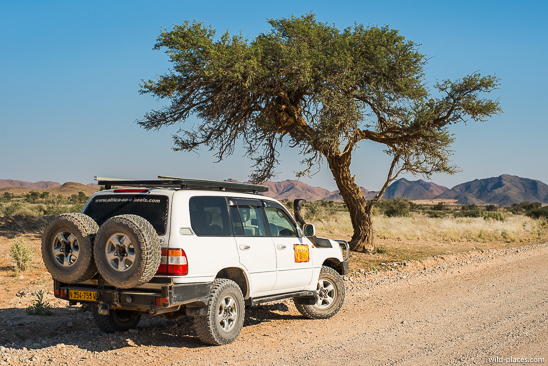 With our Land Cruiser with 33″ tyres (pressure lowered to 1.5 bar) and a powerful patrol engine we had no problems at all reaching the Deadvlei parking lot. On one evening when we returned from a sunset shooting at Deadvlei we saw an abandoned car in the middle of this soft sand section. Shortly after the car we found a women waving for help. Her friend had walked to the shuttle bus parking lot to find some help. But of course at this time of the day (it was already completely dark) there was nobody there anymore. They were driving a 4WD pickup but made the mistake of not reducing the tire pressure. Without our help they would had to spend the night there. If you already have paid the high price for the Sossus Dune Lodge this is probably not your preferred idea for the night. But of course we helped them. Maybe we are a bit over-equipped, but contrary to the stuck couple we were prepared for this kind of situation. We always carry enough water and food in the car and warm clothes to easily spend some days in the wilderness. In addition we were carrying a satellite phone to call for help in case of a real emergency. But in this case we didn’t need the satellite phone. We removed the sand piles in front of the pickup wheels with our shovel and then easily pulled the pickup out of the soft sand with our towing rope in the first attempt. Altogether we spent two mornings and two evenings shooting in the Deadvlei area. At the Deadvlei salt pan I much prefer the evening light, but the area around the shuttle bus parking lot is also very nice at sunrise. On the last morning before we left the Sossusvlei area we visited the Sesriem Canyon which is very close to the Sossus Dune Lodge. It’s not the Grand Canyon but it’s worth a visit. You can either walk along the rim of the Canyon or in the Canyon. If you walk to the left the trail ends at a pool in the Canyon with fresh water, a rare sight in a desert. 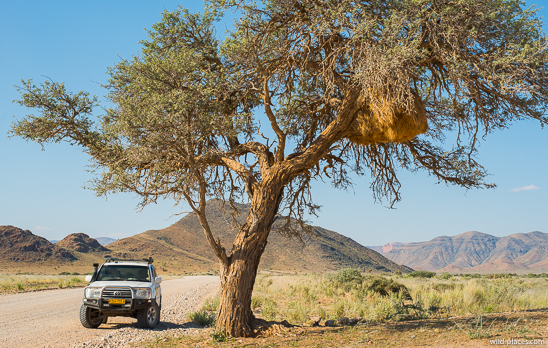 After six days at Sossusvlei we drove to Swakopmund via Solitaire, the Gaub Canyon, the Kuiseb Canyon and Walvis Bay. The gravel road was again very easy to drive. But nevertheless we were nearly involved in a severe accident. The car in front of us, a VW Polo, was driving in the middle of the road with 80 km/h (which is clearly too fast for a VW Polo on a very bumpy gravel road). Finally in a curve a frontal collision with an oncoming car was only avoided because both drivers luckily decided to escape to the ‘wrong side’. A very dangerous situation. We all stopped our cars and the Polo driver explained that he was driving on the wrong side because he felt that the road was too rough on his side. The greatest danger in Namibia are probably not wild animals but crazy tourists driving with unsuitable cars much too fast on gravel roads. Finally we arrived at Swakopmund where we checked in at the Desert Villa Guesthouse. The owner of the guesthouse was again extremely friendly and helpful. She had some great tips regarding the restaurants in Swakopmund and interesting places to visit. The only disadvantage of the guesthouse was that is has no heating. But this is typical for nearly all houses in Namibia. During the five days we stayed in Swakopmund the nights were very cold. Everything was feeling damp due to the nearby ocean. We had to use many blankets to stay warm during the night. But according to the people living in Swakopmund these were the coldest days of the year. At other times of the year this is probably not a problem. 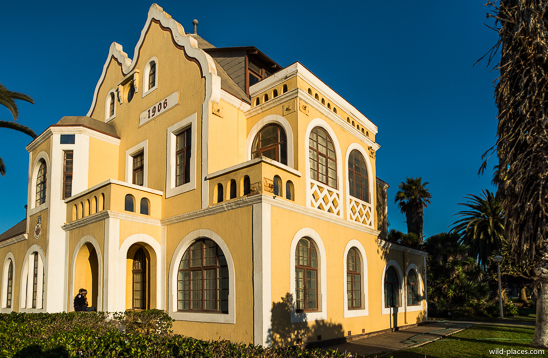 Swakopmund is the place where you find most traces of the time when Namibia was a German colony. There are many lovely houses with interesting colony architecture like the ‘Hohenzollern Haus’, ‘Altes Amtsgericht’, ‘Wörmann-Haus’ and the old railway station (now a hotel). Even if English is now the official language in Namibia, in Swakopmund most people still speak German. If you enter a shop you will be greeted in German. Swakopmund is probably the most interesting city in Namibia but it’s rather small and in my opinion not a reason to visit Namibia. If you are close by it’s worth spending a couple of hours in Swakopmund otherwise better spend your time in the fantastic nature in Namibia. While we stayed in Swakopmund we tried four different restaurants. On the first evening we went to the Napolitana. The atmosphere was relaxed with a nice mix of black and white people. But the food was not overwhelming (we had pizzas). On the next evening we went to Kücki’s Pub which we really liked. Great atmosphere and very friendly staff. The seafood plate was really good and huge. Then we tried The Tug near the jetty at the ocean. The food was good and the restaurant is designed like an old ship. But the atmosphere was a bit stiff and not as relaxed as at Kücki’s. The same can be said about the Jetty 1905. A nice location directly over the ocean with good food but a bit pricey. Our favorite restaurant in Swakopmund is clearly Kücki’s Pub. From Swakopmund we did several trips to nearby places of interest. On one day we drove for example to Cape Cross. Along the salt road to Cape Cross you find some colorful lichen fields, a ship wreck and if you are lucky some meerkats. We saw a group of about 30. 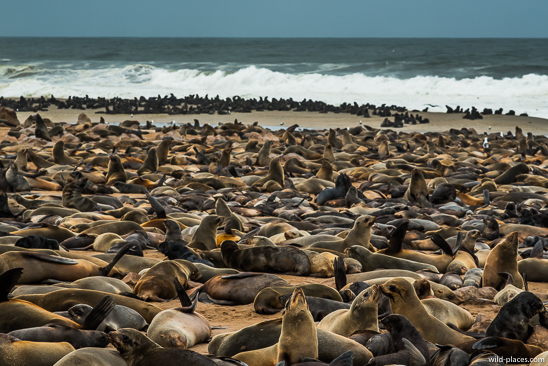 The main attraction at Cape Cross is the seal colony. There live about 250,000 seals and you can walk directly through the colony. They are everywhere. On the parking lot, the wooden board walks and even on the picnic tables. Some of them are very curious and come close, some of them are rather anxious and some will try to scare you off by baring their teeth. In addition they stink like hell. Often people get used to the smell after a couple of minutes but some people have to leave. It was really an impressive experience. Besides the seals you can also view lots of different shore birds there. Another great place to view all kind of birds are the bird sanctuaries near Walvis Bay and the coastline between Walvis Bay and Pelican Point. 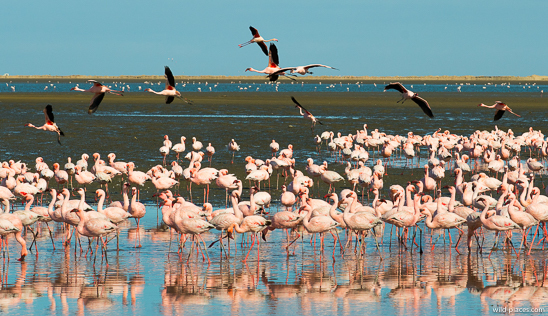 You can find there flamingo colonies with thousands of flamingos. 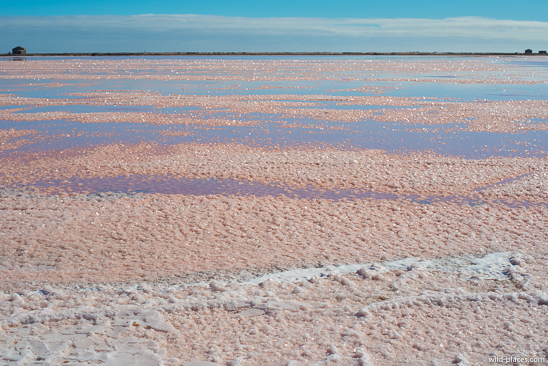 If you continue from Walvis Bay to Pelican Point you will drive along colorful salt fields. 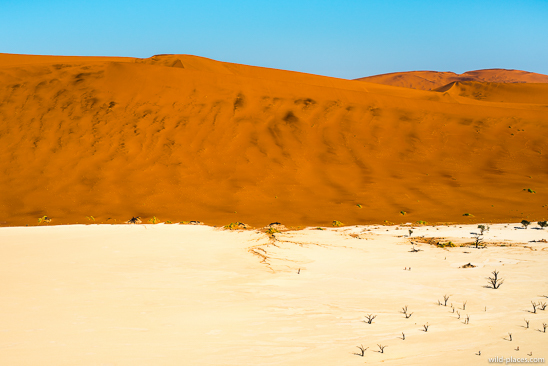 To reach Pelican Point you have to drive through a long section of very soft sand, similar to the one at Deadvlei. Since we were a bit surprised by the condition we didn’t reduce the tire pressure until we were half way through. Luckily we didn’t get stuck. At Pelican Point you can find a very expensive lodge (where day guests are not welcome) and some seal colonies. Not as impressive as Cape Cross but still nice to visit. Another day trip led us to the Moon Valley and the Welwitschia Trail. The moon valley is a lunar landscape of eroded hills and valleys carved by water and wind. In the middle of the Moon Valley you can find the farm Goanikontes-Oasis. This oasis with its many trees appears in the extremely dry Moon Valley like a mirage. At Goanikontes you can visit the different farm animals or could have a snack at their restaurant. The German owner of this farm can tell you many interesting stories about the long history of this oasis. After our short break at Goanikontes we continued on the Welwitschia Trail so see the famous plants. 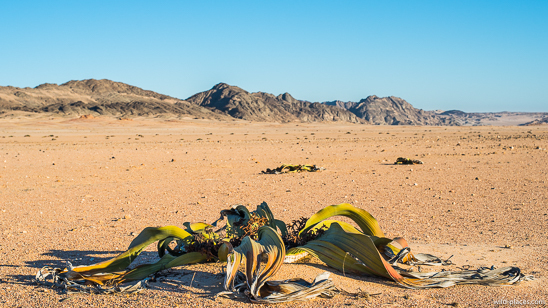 The Welwitschia mirabilis is a living fossil and is endemic to the Namib desert. It was named after the Austrian botanist Friedrich Welwitsch. It is clearly not the most beautiful plant but is has some very interesting properties. For example the Welwitschia can exist in areas with almost zero rainfall and individual plants can be more than 2000 years old. 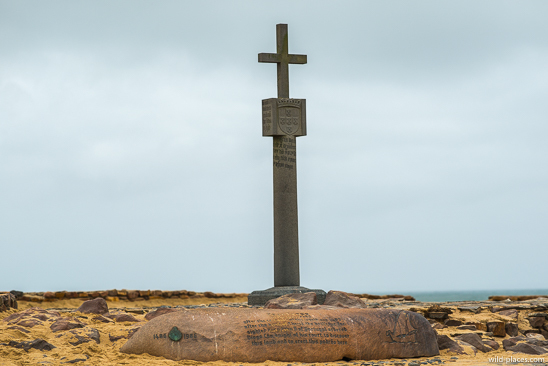 On our last day in Swakopmund we drove to the Blutkuppe. 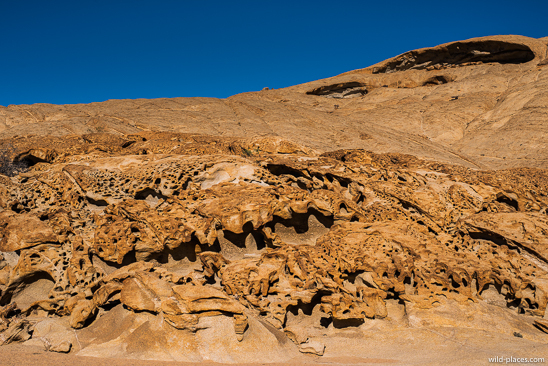 This is an interesting rock formation which shines red in the evening light and has some interesting structures. In addition there are some lovely quiver trees near the Blutkuppe. While waiting for the sunset we had some picnic in front of the Blutkuppe. Finally we had to return to Windhoek. We decided to take the C28 via Bosua Pass. Especially the middle part of this gravel road leads through an extremely beautiful landscape. In Windhoek we stayed again at The Hilltop Guesthouse. On our last day in Namibia we returned the rental car and went to the Namibia Craft Centre where we bought some nice souvenirs. The Craft Centre is located in the historic Old Breweries building. In addition to all kinds of handmade craft you can find a nice café there, where a really good cappuccino is served. After our visit of the Craft Centre we walked to the Post Street Mall, the Bushmann Art Gallery and the Zoo Park where we had another short break at the Zoo Café. On a Saturday afternoon Windhoek was much more lively compared to the Sunday afternoon when we arrived. After a quick visit of the ‘Alte Feste’ we walked to Joe’s Beerhouse for an early Dinner. Around 6 pm we were picked up by our rental car company at Joe’s Beerhouse and transferred to the airport. After another uneventful night flight with Condor we arrived back in Germany. The good thing is, that there is nearly no time difference between Namibia and Germany. This makes it much easier to get back to work on the next day (compared to for example a trip to Australia or Canada). My first impressions of Namibia are very positive. It’s a great place for landscape photography. It’s easy to get around while still being a wild place. We will definitely come back. The current plan is to do a longer trip to Namibia in summer 2017. 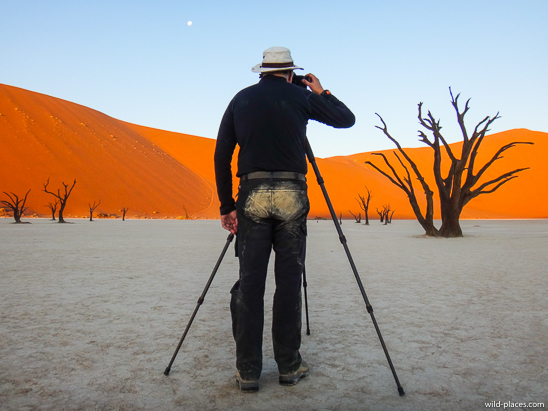 To get some good landscape images of Namibia the most important thing is to be at the right place at the right time. You really need good light to get good images and especially nice colors. And good light is restricted to about one hour before sunrise/sunset until one hour after sunrise/sunset. This means you need really good planning and you often have to return to interesting places at sunrise/sunset. Therefore spending several days in an interesting area is definitely a good idea and in my opinion necessary for good images. Namibia has also one of the clearest night skies in the world with nearly no light pollution. Therefore shooting at night is a good addition to shooting at sunrise and sunset. These are settings that worked well for me for night images about one hour after sunset: f/5.6 (to get enough DOF and sharp corners), 15-30 sec. (at longer exposure times stars will show signficant trails and will not look anymore like stars, with a wide angle lens 30 sec. is acceptable, with a 50mm lens I would try to limit the exposure time to 15 sec. ), ISO 1600 (to get enough light on the image while trying to limit the noise). Regarding photography equipment: Normally I shoot most of my images with wide angle lenses. I took three lenses to Namibia, a 21mm wide angle lens, a 55mm standard lens and a 135mm tele lens. 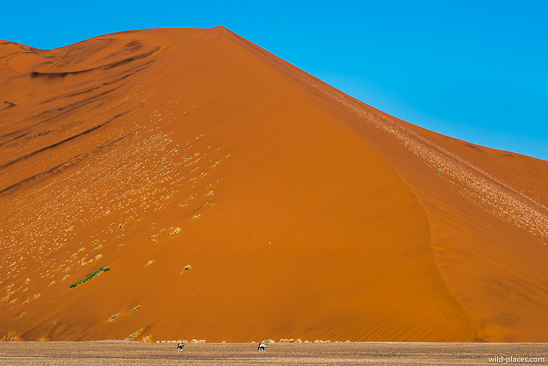 During the two weeks in Namibia I shot about 4000 images. After sorting and processing these images I kept 630 (the rest was deleted). Out of these 630 images 300 were shot with the 55mm lens, 300 with the 135mm lens and 30 with the 21mm lens. Namibia is clearly a standard and tele location for me. For landscape photography these three lenses were sufficient for me. If you want to also do some wildlife photography something longer like a 300mm lens would be useful. Since the best light is early morning or late afternoon and at night you should also bring a stable tripod. About 90% of my images were shot from a tripod. 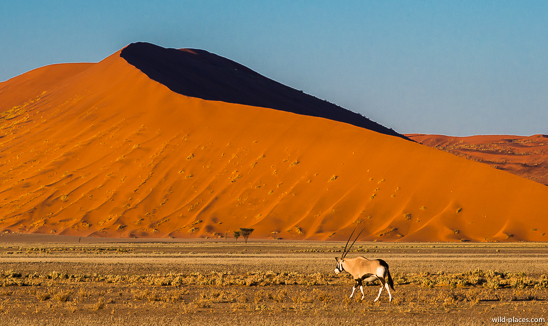 You can find my landscape images from this trip in my Namibia Gallery. I’ve also published a short article about my experience with the Zeiss Apo Sonnar T* 2/135mm in Namibia on Pascal’s Dear Susan Website. Hello Boris, interesting narrative and lots of useful information for potential visitor to Namibia. Beautiful photos. Very helpful commentary and great photos. Clearly, plenty of time to focus manually. Thank you. I was in Namibia also in Juli 2015, 3.5 weeks but we made a wider tour. If your interested in landscapes, Damarland is also great. We stayed at the White lady Lodge with views on Brandberg and in Mowani Mountain Camp (see my site link). Especially Mowani has a unique sunset location on top of the hill, but you need to stay at the lodge to use it. Thanks Marco! We plan another trip to Namibia next year. Therefore your suggestions are really helpful.